Lot # 28: 1954 Bowman #66 Ted Williams (PSA NM/MT 8) – Only 3 PSA Examples Graded Higher! 1954 Bowman #66 Ted Williams (PSA NM/MT 8) – Only 3 PSA Examples Graded Higher! 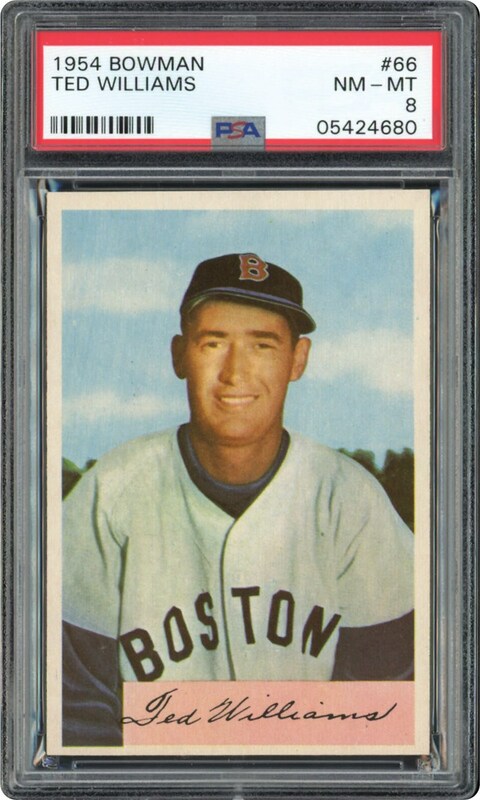 One of the most coveted post-WWII cardboard scarcities is the 1954 Bowman #66 Ted Williams subject that is believed to have been prematurely withdrawn from the set due to contractual issues. Replaced with a Jim Piersall subject, the #66 Ted Williams is highly pursued by elite enthusiasts and along with Ted's Wilson Franks card, the most valuable 1950's Williams cardboard collectible. Presented here is an absolutely breathtaking 1954 Bowman Williams in a PSA 8 holder with PSA's illustrious "pop" chart indicating a mere 3 specimens have been graded higher (of the approximate 1,050 PSA encapsulated examples)! "I would love to walk down the street one day with people passing me, stating: "there goes the greatest hitter the game has ever seen." Such was the dream of a young Ted Williams as he pursued his place in baseball history with a steadfast persistence, with his dream ultimately becoming a reality for most historians agree that "The Kid" surely stands as baseball's premier all-time hitter! The "Splendid Splinter" not only handled the bat better than anyone who ever stepped into a "batter's box," but served two stints as a fighter pilot in World War II and the Korean War, shooting down an incredible 16 enemy aircraft. It is, therefore, both his baseball iconic stature and wartime heroism that led to him being the true embodiment of a National hero. His "half-body" pose on this cardboard wonder is a strong testament to William's legacy, depicting the finest possible contrast and clarity, set against an ultra-eye pleasing tranquil partly cloudy sky background. Atypical for this issue is the near perfect "side-to-side" centering with the image somewhat favoring the lower edge. Right angled corners, sharp edging, virtually flawless surfaces and a pristine like reverse side complete this incredible Williams keepsake that still eludes a myriad of advanced enthusiasts in high-grade. 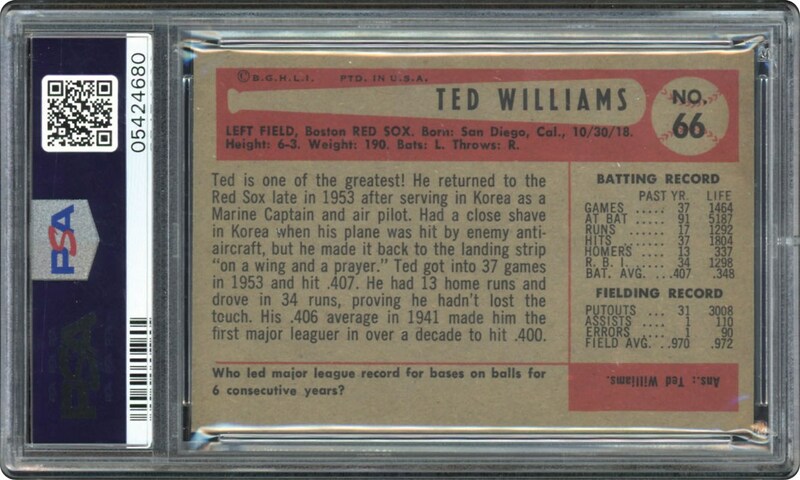 The irony is that Ted Williams, whether hitting a baseball or shooting down enemy aircraft, was the best at his craft and, likewise, this picturesque depiction of his 1954 Bowman card represents one of the finest copies in the hobby!